For details on this book, click on the cover image at left. Here's a plot summary, thanks to Craig Fuqua. I don't think we're too worried about spoilers. Race is away and Jonny is bored on the island while his dad works on his anti-laser equipment. Jonny sees paratroopers landing on the island, so he runs up the "secret cave" which leads to a trap door in the lab. While trying to leave, Jonny trips and falls on the floor as the invaders burst in. The Quests are held hostage and the leader arrives. Then Race pops in through the trap door, backed by government troops and turns the tables. At supper, Race explains that Jonny fell on the trouble signal button on the floor. Select this link for an image of the cover of the hardback version of the book. These are fairly rare publications, published in 1965 and 1966 by World Distributors, England. 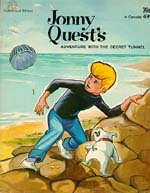 Inside these large, hardback books are 90+ pages featuring Jonny Quest, Dr Benton Quest, Bandit, Roger "Race" Bannon in color picture-strips and stories. 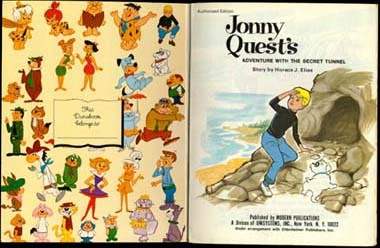 This photograph features the 1965 annual opened, showing the artwork on the front and back covers. 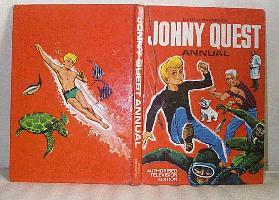 Below are looks at the 1966 annual, showing the front cover (left) and back cover.